Home » Safety » To Backless or Not To Backless? That is The Question. To Backless or Not To Backless? That is The Question. Statistics are funny things. Somewhere, there is a study that will support just about anything. If you have a pre-conceived notion about something, Google will lead you to some research that will validate your thinking. Of course, that research may have been financed by the same entity that stands to benefit from the conclusions. Or perhaps it was printed in some fly-by-night publication, rather than a well-respected, peer-reviewed professional journal. Or maybe it was just some online “white paper” with dubious research. Other papers seem to bypass the principles of scientific method and tailor the data to support the hypothesis they hoped to prove. Some admit they don’t have enough data points to make statistically significant conclusions. Plus, there are flaws and limitations even in the best studies published in respectable scientific journals. Sometimes, a study conflicts with similar studies and it’s impossible to determine if one is more valid than the other. In other cases, a newer set of studies compiles more data and uses better methods, making older studies obsolete. High back boosters do have some theoretical benefits compared to backless models. For example, some backless boosters lack an adjustment strap for the shoulder belt. This type of strap is easily lost or misplaced on models that do include it, whereas high back boosters always have an integrated shoulder belt guide to help keep the seat belt routed correctly. Also, many high back boosters now have deep wings lined with energy absorbing materials to help protect the head and torso in a side impact. The same wings may provide more comfort for a sleeping child, too. A few boosters allow them to be attached to the vehicle with LATCH. In particular, early research outside the USA with ISOFIX systems may show some benefit to rigid LATCH boosters, especially in side impacts. Of course, theoretical benefits don’t always translate to real world safety. Many newer vehicles have adjustable shoulder belts that can help kids get the proper shoulder belt fit, even without an adjustment strap or a high back booster. Some of those side impact features on high back boosters may seem impressive, especially with the video crash tests you may see in marketing information. What they don’t tell you is that many side impact crashes have an element of forward motion. For example, consider that you are moving through an intersection and someone T-bones your car because they didn’t stop for a signal. Your car is not only struck from the side, but it is also going to slow down to a stop very quickly. Not as quickly as a head-on crash, certainly, but still quickly enough that the child’s head and upper body could be thrown forward, beyond the protection of those wings around their head and torso. Those same wings that look so effective in staged crash tests may not even help at all, unless the child’s head is perfectly positioned and remains within the protective wings during a crash! As for LATCH, we have no indication in North America that boosters with LATCH provide a safety benefit. Plus, only a few like the Jane Indy Plus, Clek Oobr and Cybex Solution X-fix even have rigid LATCH in North America. The reality is that we just don’t know if this feature is anything more than a convenience feature for boosters, yet. That isn’t to say that high back boosters have no significant benefits over backless boosters. After all, real world data shows they are 70% more effective than backless boosters, right? Right? Well, you might ask what 70% means. Many studies use relative terms like “500% less risk” or “2 times safer”. Those sound very impressive. But they are nearly meaningless without some absolute reference. If your child has a 1 in 10 risk of being severely injured in a crash this year, then making them 2 times safer and cutting their risk in half, to 1 in 20, sounds like a no-brainer. But what if their risk is 1 in 1,000? Still probably a no-brainer if it doesn’t cost you a fortune, right? What about 1 in 100,000 or even 1 in 10 million? At some point, the absolute risk is so low that even being 2x safer isn’t a significant benefit. At the very least, at some level, there may be other considerations to consider like cost, time and effort. Those interested in booster seats in general may also be interested in this newer study by NHTSA, though it does not specifically discuss high back vs. backless boosters. Along with the 2009 study from CHOP, it appears to confirm that boosters, both high back and backless, are indeed preventing injuries for kids 4-8 years old. On a related topic, it also suggests that 3-4 year olds may be even safer in a restraint with a 5-point harness, rather than a booster. Of course, you can always find studies that claim otherwise. Even so, based on the conclusion above, parents can be assured that a backless booster is safe for their older child. In addition, other major organizations, like NHTSA, Safe Kids USA , the National Child Passenger Safety Board, CHOP and the American Academy of Pediatrics do not make a major distinction between the safety of high back and backless boosters in their outreach to parents and caregivers. While high back boosters may have theoretical safety advantages, backless boosters have some benefits of their own. Because the child can be seated flush against the vehicle seat back, I wonder if that might give them up to an extra inch of excursion to keep their head a bit farther from some part of the interior. Similarly, a backless model may fit better in some vehicles with fixed head restraints that may interfere with a high back booster. In a more practical concern, backless boosters are small and light, making them easy to bring on a trip or transfer to another vehicle. The low profile of a backless model may be appealing to older kids, who may not like to be seen riding in a booster at all. Finally, perhaps the biggest advantage is that backless models tend to be inexpensive, sometimes selling for $15 or less on sale at discount stores, like the Harmony Youth Backless Booster that has sold for as low as $13.50 recently at Walmart. It also received an IIHS “Best Bet” rating. Other backless models like the Evenflo Big Kid Amp and the Harmony Olympian (previously known as the Secure Comfort Deluxe) sell for just $20 to $30 and also were named Best Bets by the IIHS. A few years from now with the next study, we may well find that that high back models do provide some overall safety benefits. For example, the latest and greatest boosters with side impact protection claims are probably not reflected in the data for even the most recent studies. While there is no harm in suggesting a high back booster for a number of reasons, there could be harm in suggesting that a backless booster is not a safe choice. That is because for some parents and kids, the choice is not between a backless or a high back booster, it is between a backless booster or no booster at all. To summarize, based on the latest information we have, technicians and advocates should not be discouraging parents from the use of backless boosters, when used properly in accordance with the owners manuals. The main exception is when a high back booster is required to provide the necessary head support, for vehicles with low seat backs or inadequate head restraint. Excellent analysis, particular appreciate the survey of available data. Thanks! 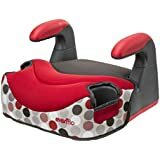 Is there any research that shows that a backless booster seat is safer if between 2 other car seats in the back row of my SUV? I agree that parents/caregivers should consider the whole picture before making an educated decision on whether to chose a highback or backless booster. Child age, size, maturity level, sleeping comfort, vehicle crash worthiness, seating position in the vehicle (center vs. outboard), etc., should all factor into the final decision. Danielle, that is a good point and certainly the latest and greatest boosters aren’t even considered in the statistics. One could also guess about other factors. For example, perhaps backless boosters peform as well as the best high back boosters in newer cars with side curtain airbags and improved crash protection. Some of this research was mentioned at LifeSavers last year… I kind of wonder if the type of HBB (dedicated HBB vs combo/3in1 that doesn’t position belt well or adjust for height) has any influence on the safety difference between HBB and backless. The IRL studies so far don’t differentiate between “good” and “poor” HBBs, and I think it’s highly possible that having both in one category (HBB) influences the apparent safety margine (in other words, maybe a “good” HBB is safer than a backless but a “poor” HBB isn’t any safer than a backless). I agree… a lot depends on the kid him/herself, the car, and the budget. at the end of the day, you do the best you can. Obviously, a highback is probably safer for younger booster riders because they are more likely to fall asleep and feel the urge to wiggle, and a high back and protective head wings helps with both those things… but I have no problem with larger kids being in backless boosters… and of course, a backless is always safer than no booster at all, as long as it fits the child properly and provides a correct seatbelt fit. Crap. Now I’m wondering if I should cancel the order with the two new high back boosters I bought. I love that you look at all considerations when drawing conclusions. Research is important but real world pragmatism is king, imo. What worries me about this — and it’s not a reason not to discuss it, it’s just my worry — is that between discussions of boosters being just as safe as harnesses and discussions of backless boosters being just as safe as high-backed boosters, we’re going to get parents making the leap that their 3.5yo should be in a backless booster. I prefer highbacked boosters; I just do. But I have absolutely no issue with a 7- or 8yo who is outgrowing a highbacked Turbobooster riding in that booster with the back off instead of buying a Frontier to use in booster mode. I do have concerns about tiny young kids going from a Scenera to a backless. I don’t think most 3/4yos are ready for that much freedom in the car. Excellent work, Julie! Very nice writing, and great points. Excellent commentary, as usual, Darren. Thanks!